After 66 days missing at sea, Jordan was finally rescued by a passing German freighter and brought ashore by the Coast Guard in good condition. Early Friday, just hours later, the bearded 37-year-old man walked out of the Norfolk hospital where he was reluctantly taken, showing no obvious ill effects. "We were expecting worse with blisters and severe sunburn and dehydration," said Coast Guard Petty Officer 3rd Class Kyle McCollum, a member of the helicopter crew who brought Jordan ashore. Jordan hadn't been heard from since Jan. 23, when he set out on a fishing expedition aboard the single-masted sailboat that had been his home for months at a marina in South Carolina. The mast of Jordan's boat had broken off in heavy weather, and the vessel appeared to have flipped over multiple times, said Thomas Grenz, captain of the German container ship. 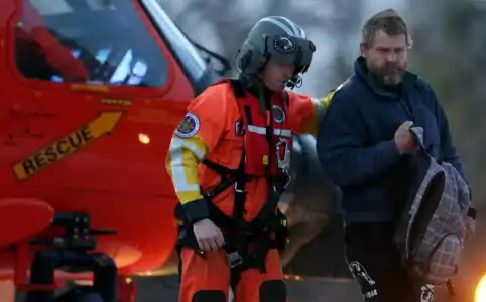 It was unclear how long after leaving port that the boat was damaged, the Coast Guard said. Jordan was plucked from the Atlantic about 200 miles off the North Carolina coast on Thursday afternoon after furiously waving down the container ship. His boat was upright at the time, Grenz said. Jordan asked his Coast Guard rescuers to drop him off without seeking medical care, but he was taken to a hospital anyway as a precaution. He demonstrated a firm handshake and weary-looking blue eyes before declining an interview with The Associated Press on Friday. In interviews with other news organizations, he described making pancakes out of flour fried in oil, collecting rainwater with a bucket, and using a net to catch fish that would swim in and out of his clothes when he put them over the side to rinse them. He told WAVY-TV in Norfolk, Virginia,(http://bit.ly/1FpmfUd) that he got by by rationing his water and energy and praying for help. "Every day I was like, 'Please God, send me some rain, send me some water,'" he said. Jordan had been living on his 1950s-era boat in Conway, South Carolina, near Myrtle Beach. He told his family he was going into open water to sail and fish, said his mother, Norma Davis. Grenz, the German captain, said Jordan told him he had set out with about a month's worth of provisions. Jordan told WAVY that he rationed his water to about a pint a day, but "for such a long a time I was so thirsty." Jordan told his rescuers that he may have broken a shoulder when the boat was tossed around. McCollum said Jordan had slight bruising on his collarbone but seemed to have no trouble moving his arm and did not appear to be in any pain.